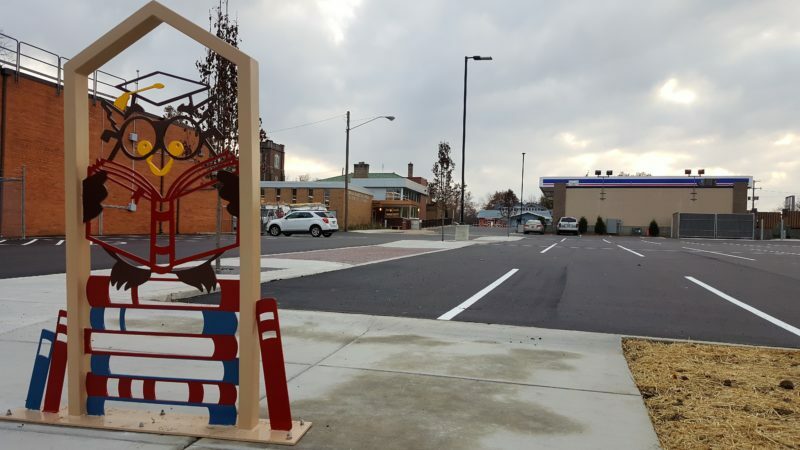 The functional and creative “owl” bike rack brings a bit of whimsy to the recently redesigned parking lot located off of East River Street in downtown Grand Ledge. The scholarly owl incorporates numerous books which is relatable since this parking lot provides access to the Grand Ledge Area District Library, as well as numerous other area businesses and nearby parks. The owl adds artistic flare to a frequently visited area of downtown. “Artist designed bike racks provide yet another avenue to integrate art into our daily lives while enhancing the community,” said artist and owner, Ken Thompson of Flatlanders Sculpture Supply. The owl is one of three functional bike racks designed by Flatlanders. A rollercoaster is located at Island Park and a fish is located at Jaycee Park.